Are Pets a Good Idea in Retirement? Pictured above: The distant mountain view from Greenville, TN, former home of U.S. President Andrew Johnson. Have you visited the photo pages we started at Pinterest? We&apos;ve created several fun boards about retirement including: Best Places to Retire, Baby Boomer Nostalgia, Bucket List, and 7 more like them. Follow us there! We apologize for the problem many of our Daily Digest subscriber have had the past few days with Blog links. As always go to the Blog and access everything there (hit Refresh if the page doesn&apos;t look right). Are Pets and Retirement A Good Mix? The majority of U.S. households own at least one pet. But what is the right decision about pet ownership once you retire? Your life is probably changing - there are probably some very good reasons to own a pet - and some not to. This article explores the pros and cons for the "mix" of retirement and pet ownership, plus some strategies to keep in mind. This town of 15,000 folks in Eastern Tennessee has several historical significances. 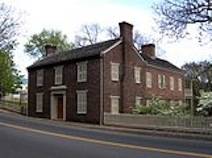 It was the home of U.S. President Andrew Johnson, and the capital of the short lived capital of the State of Franklin (yep, they tried to secede from NC a long time ago). These days the town is working hard to become a retirement destination. Click on a state to see reviews of 891 great retirement towns, plus capsule summaries of 1930 active adult communities. When you inherit an IRA from a parent, sibling, or spouse it is not as simple as taking the money and spending it. That stems from the tax deferred status of IRAs - somebody has to pay the taxes someday, and that is probably you! The rules are complex and differ according to who gave you the IRA. This article will help explain the situation. 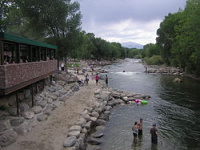 If you are one of the many folks in love with Colorado, Salida could be one retirement destination to consider. There is a nice ski resort right outside of town, a wild river runs by the edge of town, and 14,000&apos; peaks beckon nearby. A bit bohemian in feel, there is a historic old brick downtown with art walks and restaurants. Have you taken our Free Retirement Ranger quiz? Answer 10 quick questions, get a free custom report of the towns and communities that fit your retirement. We offer a daily digest and 2 weekly active adult community newsletters besides this one. You or your friends can get free subscriptions here.